* For the pin layout, Google "Wemos mini NodeMcu". For example D5 is equivalent to GPIO 14. * Solder properly. Use a LED to test if it will lit. * Download the Arduino IDE from the arduino.cc site at en/Main/Software. * I found an OSX driver for the board at github.com on "adrianmihalko" 's page. You will want the files under the ch340g-ch34g-ch34x-mac-os-x-driver repository. * Once both of these are installed open up the Arduino IDE. * Go into the preferences and add the url as stated in the product description above (sorry can't post the url here). * In the "Board Manager" search for and install the latest version of the "esp8266" generic module. * Select the new "Port" added by the driver: (mine was "/dev/cu.wchusbserial14120"). * Set the "Reset Method" to: nodemcu. You'd better to write a simple "blink" sketch and upload it to your board to see it work. The LED pin on this board is "2". This is a powerful Internet of things development board; standalone board mount, stackable on top, or stackable top and bottom. 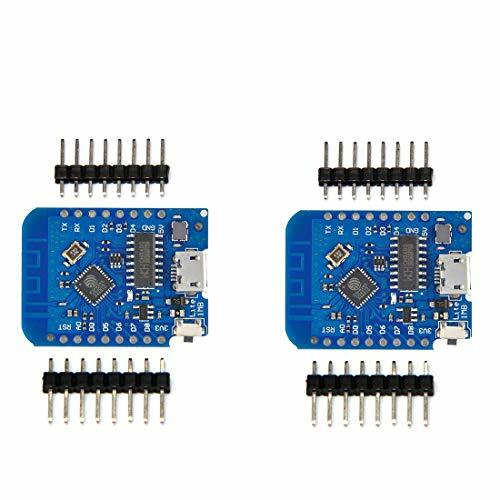 Although these D1 Minis have only 16 pins, you're still getting 10 digital I/O and the one A0 analog pin, a reset pin, plus the ground and one 3 volt and one 5 volt pin. This is enough for most projects. After all, you do get the hardware I2C and SPI pins (on D5 through D8). This D1 definitely fits on a standard breadboard leaving one open hole available for each pin (on both sides) but being shorter than the 30 pin boards you will have about 6 more rows available for prototyping, especially nice when using the short 460 tie point breadboards. 11 digital input / output pins, all pins with interrupt / PWM / I2C / support 1 line (except D0); 1 analog input(3.2V max input). Micro USB connection; Compatible with Arduino; 1MB Flash; 500mA resettable fuse. Be aware that the old driver can cause your machine to lock up. If you installed an earlier version of the driver (the one I had had no version number in the file name) search for instructions to remove it.